Our B&B is a great value guest house in Southville, Bristol. We are a family-run B&B in Bristol with 14 very comfortable guest rooms available. Our guest house is perfectly located close to the centre of Bristol and a good alternative to cheap Bristol hotels and travellers hostels. 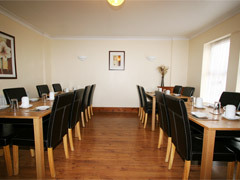 All rooms are light and airy, with clean bedding and fresh towels provided. Our bed and breakfast in Bristol is ideal for business trips, stag and hen weekends, family weekend breaks or long term contractors bed and breakfast accommodation. Our B and B is situated in a quiet street off a main road so you get a good nights sleep but allows you easy access to all the Bristol tourist attractions, Bristol airport, M5 and Wales. All B&B rooms have FREE WiFi and FREE parking is available in our private car park for residents, subject to availability. This bed and breakfast really is ideal for workers and contractors who need a good base in the week and great value accommodation for families and nights out at weekends. Located less than 10 minutes walk from Bristol's historic docks, Bristol city centre and Bristol's lively nightspots and clubs. Our B&B rates are based on per room, per night and include a continental breakfast for each guest. Located in a quiet residential street in the center of Bristol, our B&B is ideally positioned for business and holidays.